Our thanks to Rob Durkee, author of American Top 40: The Countdown of the Century, for this recording of his interview with Larry Marino on KIEV, Los Angeles, on November 26, 1999.
. . . Ron Jacobs was the guy behind the scenes . . . This radio interview conducted by Larry Marino was broadcast on KIEV (870 AM) Los Angeles on November 26, 1999. Marino and author Rob Durkee discuss the infamous Dead Dog outtake, Shadoe Stevens, and lots of AT40 trivia. American Top 40, the radio program co-founded in the 1960's by host Casey Kasem and producer Don Bustany, developed a winning formula of countdown and commentary that has influenced all the "top ten" hits shows since. In American Top 40: The Countdown of the Century, the true story of the show's development and growth into the most popular radio show in the country is told through the people who made it happen. 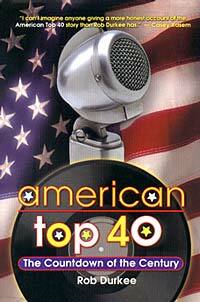 Author Rob Durkee worked on American Top 40 from 1989 to 1995 as Staff Writer and Chief Statistician. Using his experience as a journalist and disc jocky, he has spent several years researching the history of countdown radio and has interviewed many of its key players. Durkee writes of one his "life's most inspirational moments"  in January, 1995  "when Ron Jacobs, who 25 years earlier helped kick-start the show, walked into the announcing booth ... At that moment, I said to myself, 'I've got to write a book about this show'.."
Reel Top 40 Radio Repository ©1996-1999 Richard W. Irwin.